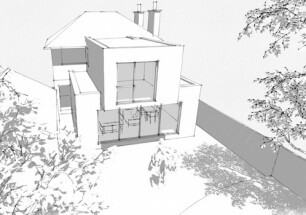 We obtained Outline Planning Permission for this dwelling in the rear garden of a large Victorian detached Villa in Bangor West. 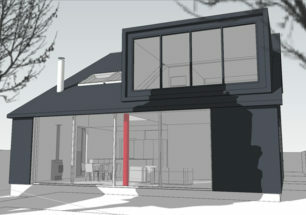 We followed up with a full application for an eco home incorporating, solar panels, photo voltaic’s, wind turbine and a whole house ventilation system. As there was a problem with lying water on a low level clay based site a rainwater attenuation system was used in conjunction with rainwater harvesting to alleviate ground water problems.After reasearching a number of alternative building aproaches with the client we opted for a SIP frame solution. Due to budget constraints some of the plug-ins were dropped from the construction, photo voltaics and wind tubine. 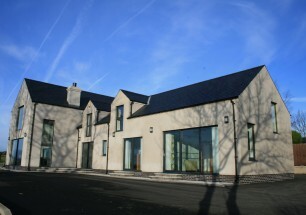 The fabric first principal of high levels of insulation and air tightness have created a bright, warm home with low running costs. Structural insulated panels (or structural insulating panels), SIPs, are a composite building material. They consist of an insulating layer of rigid polymer foam sandwiched between two layers of structural oriented strand board. SIPs share the same structural properties as an I-beam or I-column. The rigid insulation core of the SIP acts as a web, while the sheathing fulfills the function of the flanges. SIPs combine several components of conventional building, such as studs and joists, insulation, vapor barrier and air barrier. They can be used for many different applications, such as exterior wall, roof, floor and foundation systems.A well-built home using SIPs will have a tighter building envelope and the walls will have higher insulating properties, which leads to fewer drafts and a decrease in operating costs. 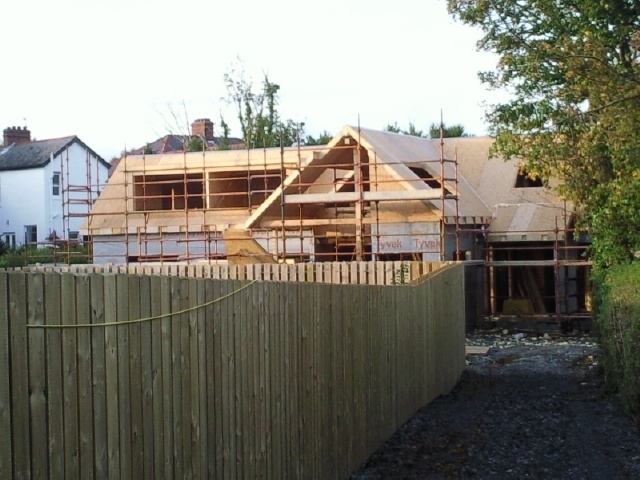 Also, due to the standardized and all-in-one nature of SIPs, construction time can be less than for a frame home, as well as requiring fewer tradesmen. The panels can be used as floor, wall, and roof, with the use of the panels as floors being of particular benefit when used above an uninsulated space below. As a result, the total life-cycle cost of a SIP-constructed building will, in general, be lower than for a conventional framed one—by as much as 40%.